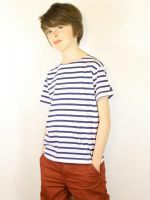 Men's short sleeved white and navy blue stripe Breton top in a 100% lightweight cotton with a label tag on left arm. 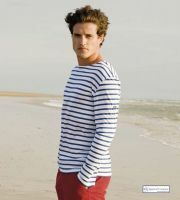 A striped tee-shirt perfect for the summer. Designed in France. Our manufacturer has changed the sizing in 2016 so we have a mix stock which is listed as Old and New. It is the same cotton, same style so it listed as "Bust/Chest to fit size" to make it easier for you.